The phrase 'you are what you eat', is normally directed towards humans, but it applies equally to animals as well. In particular, your dog's health will be directly related to the nourishment levels of the meals you feed him. Unfortunately, even if you try to feed him a healthy diet, he may not benefit due to having a sensitive stomach and being unable to eat many foods. Hill’s dog food is specifically designed for such dogs so let's take a more detailed look at its merits. Hill's sell over $2 billion of pet food every year making them the third largest pet food company in the world. That's quite a feat for a company whose humble beginnings began in 1931 with Dr. Mark Morris trying to formulate dog food for a German Shepherd guide dog suffering from kidney failure. The formula he and his wife came up with was a success and today Hill's range of nutritious pet foods include formulas for cats, dogs, kittens, and puppies. In many cases they are designed to address specific health and fitness problems. This formula is for dogs who suffer from sensitive stomachs or skin, so if your dog struggles to digest its current food, or their skin is affected by certain foods, then you should read on to find out more. For the 'who' here we'll talk about the dog, rather the owner. In terms of a healthy digestive system, the formula of this dog food is designed for dogs who regularly get upset stomachs, have diarrhea or loose stools more often than is good for them, and who struggle to digest any of the main dog food brands. If your dog's stomach seems to be in order most of the time, but their coat and skin have issues such as dull fur, or excessive irritation, then this dog food’s ingredients such as Omega-6 fatty acids will help restore and calm them both. You'll receive the bag of Hill’s dog food formula, which in this instance is chicken flavored and in a 30 lb. bag. More important is what that formula contains so here are the main ingredients: chicken meal, rice, barley, pea protein, whole grain sorghum, and flax seed. It also includes apples, broccoli, carrots, and cranberries, which might have you begin to think that your dog is going to have healthier and tastier meals than you are from now on. In terms of the specific nutritional elements, it includes Vitamins B12, C, D3, and E, Riboflavin, Biotin, Folic Acid, a whole list of minerals, and Omega 3 and Omega 6 fats. As this dog food from Hill's is specifically designed for dogs with sensitive stomachs or skin, let’s look at exactly how it helps dogs with either, or both, of these problems. One of nature's gifts to humans and to animals of all shapes and forms, are Omega 3 and Omega 6 fatty acids. These are classed as essential fats and do wonders for our good health, but unfortunately the human body, and more importantly in respect of this review, a dog's body, cannot produce them. They need to be sourced from nature’s food larder, so to ensure your dog gets enough fatty acids you need to feed it a food which contains ingredients high in Omega 3 and 6, which this Hill’s dog food does. These fatty acids, along with other nutrients like Vitamin E, have multiple health benefits for dogs, especially in relation to their skin and their coat, which is why Hill's recipe is ideal for dogs with sensitive skin. In relation to a sensitive stomach, the fact that Hill's Science Diet does not contain any artificial preservatives, colors, or flavors is a huge plus before we even consider the ingredients. The recipe has been tested to ensure that it allows for easy digestion, is nutritious, and is balanced so that your dog receives the correct number of vitamins, minerals, antioxidants, and amino acids. It is a formula that has been recommended by veterinarians, and whilst we haven't tried it ourselves, we're sure the chicken flavor is delicious too. It is not wise to simply stop feeding your dog one type of dog food and put it straight on to another one. There will be big differences in nutritional levels, and even if the new level is better for them in the long run, you need to make the transition over a few days. Just as you would wean a puppy from puppy food to adult dog food, you do the same here. 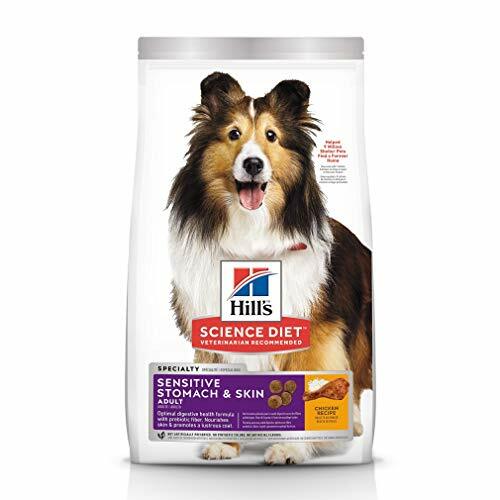 On days 1 and 2 mix their current food in proportion to Hill’s at 80:20, on days 3 and 4 make it 50:50, days 5 to 6, 20:80, and from day 7 onwards you can give them 100% Hill's dog food. There is no need to mix Hill's food with anything else, as it is a complete food. One other important point is that this formula should not be fed to pregnant or nursing female dogs nor is it suitable for puppies who have their own range of Hill’s dog food specially for them. This version of Hill's Science Diet is for adult dogs who are medium or large, but what if you have a small, toy, or miniature breed? Well, they cater to them too, with virtually the same formula but with smaller kibbles to make it easier for smaller dogs to chew and swallow. As an alternative to Hill's, you could try Purina's sensitive stomach dog food which is designed to be gentle on the digestive system. Their formula is extremely popular, and its main ingredient is real salmon, which proves it is not just cats who love fish. We hope you agree that you are solely responsible for the health and well-being of your dog. Unlike humans, they do not choose an unhealthy diet, they are given it by their owners. However, what if you feed them a truly, nutritious diet, and their skin or stomach is still showing signs of ill-health? The answer is Hill's Science Diet Adult Sensitive Stomach & Skin Dog Food, which has a list of ingredients that wouldn't look out of place on the menu of your favorite restaurant. More importantly, it has the vitamins, minerals, and other nutritious ingredients specially formulated for their sensitive stomach or skin. Feeding Hill’s dog food means that Fido can enjoy his meals once more, and you can have peace of mind knowing your companion is happy and healthy.